Get two head-pounding sample packs for one bundle price. These hard rock and metal drum loops and samples were recorded in the cradle of metal and thrash: The Bay Area. This downloadable bundle unleashes two distinct flavors of heaviness: brutal modern metal and modern hard rock. 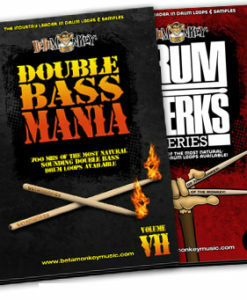 The Power Combo Pack puts the power of Double Bass Mania VII and Drum Werks II: Reloaded together for only $59.99. 2.1 GB, Apple Loops, Rex2 and WAV formats. 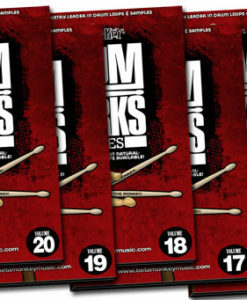 Includes extensive drum and cymbal samples. 4 GB of powerful live rock drum samples recorded in one of Los Angeles' favorite drum rooms by A-list in-demand studio drummers. This all-acoustic drums pack includes all six (6) of the sample libraries in the popular L.A. Sessions Series. 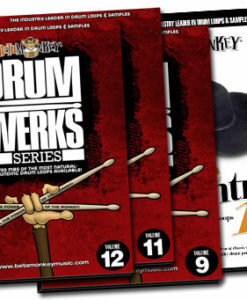 SIX (6) powerhouse rock drum loop collections to inspire your songwriting. All available loop formats (16bit WAV, 24bit WAV, APPLE LOOPS, REX2) included with purchase. The Rocking Nashville Sessions Bundle is easier than going to Nashville to get great drum tracks into your music! Shuffles, swing shuffles, 12/8 blues, trainbeats, ballads, modern country rock, these are the essential drum beats of blues, rock, and country in one single sample package. Total Sample Content: 2.3 GB, including multi-velocity drum & cymbal samples.